The name Lela is more than a play on the names of the founders; derived from two Sanskrit terms meaning “creation” and “creative spark”, with references to “play,” it denotes the spirit of the performance group. 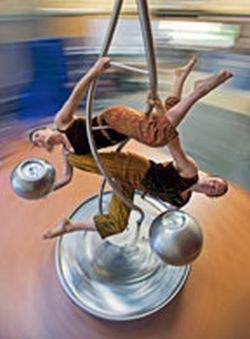 The company combines modern and aerial dance, music, theater, and large interactive musical sculptures to create innovative works of awe and whimsy. Their work is about the transfer of energy, the emanations of the soul, and the common denominators of the human experience. Mann and Lamblin work with a synthesis of form, space, movement, and music in a collaboration that draws on the unique contribution of each. Ela Lamblin is a sculptor/musician who is known in Seattle for his past collaborations with the UMO Ensemble. Lamblin’s musical instrument/sculptures represent a harmony of sound, form, and movement meant not solely to be looked at and walked around but to be sounded and intimately experimented with. They appeal both to the ear and to the eye and, because they are thematically indicative, to the soul and to the consciousness.